Indians are on a bit of a stir at the moment! The announcement of demonetization on the 8th of November was not well received by the masses of many cash-friendly citizens. While this sudden change is a rather unpleasant thing, there is a bright side to it, one that only sees a whole host of benefits that could have an adverse effect the Indian economy. Some gradual yet positive changes are the curbing of black money and the implementation of a cashless economy that could see India level with many other countries, that have already moved to a similar system. On a business perspective, both big firms and SMEs will be delighted with the cost benefits of online transactions and closer connectivity it brings with potential customers. When it comes to real estate and its various sub-branches, the curbing of black money will significantly increase its transparency. Mostly, reputed developers in real estate virtually do no transactions in cash, so it’s business as usual for them. But for tier 2 and tier 3 cities, the impact could be on the negative side, as the dealings are done mostly in cash to avoid high tax payments. Apart from reducing cash transactions, demonetization will help reduce the parallel economy, making the cost of raw materials go down, resulting in much more affordable housing projects. Many acts like the RERA (Real Estate Regulation and Development Act, 2016), the Real Estate Regulatory Authority Bill and the Benami Transactions Act have already made an improvement to smoother real estate deals; demonetization could add to that smoothness. For those who feel that the cost of a house is still too high, demonetization will make EMI transactions cheaper, making it much easier to purchase a home. The Real Estate Regulatory bill has made it mandatory for developers to disclose all information about their property to potential homeowners. Add demonetization to the mix and you, as a wannabe homeowner, will get better transparency on all minor details that are missing outside of online transactions. The bill also eradicates the rather ambiguous term known as “super built-up area”, which the total carpet area builders consume and sell on with every project undertaken. Developers may also push for the removal of section 43CA of the Income Tax act, as it will become redundant to charge tax on deemed income. The curbing of black money is a boon for the Reserve Bank of India, which directly affects the rate of interest many banks offer. Lower interest rates mean more individuals will be open to the idea of taking up home loans or loans to purchase corporate offices. The RBI is expected to reduce REPO rates by 2 percent, which can reduce loan rates banks offer up to 7 percent in the next twelve months and a further 12 percent in the next few years. Overall, there can only be a positive impact to the real estate industry with trust and sentiment playing as defining factors. Demonetization brings an ideal time for the real estate savvy to start investing on more than one home. The reduced interest rates on fixed deposits, capital appreciation, rental income and support from banks who offer low interests loans are more than enough reasons for one to think about investing in real estate. Developers will also offer fully furnished homes at an additional price, so if you leave one of your houses for rent, that income is going to be precious. As small scale industries still depend heavily of hard cash, demonetization will give them hope as more money is now flowing into banks, opening up the opportunity for these industries and for people in the unbanked sector to be confident in applying for corporate/home loans. More buyers ultimately mean increased returns for landlords, a big win-win for every wannabe homeowner and home seeker. Large scale developers will see more people opt for cashless purchases with already more than 70 percent of the crowd in Bangalore and Mumbai doing so. Real estate is the most profitable investment you can make. With demonetization added to the mix, there is no better time to invest in a property or land. As mentioned earlier, demonetization also encourages multi-purchasing of properties, which doubles the economy and widens the smile on your face! Technology has opened the chance for consumers to interact directly with developers, rather than approach 3rd party services. 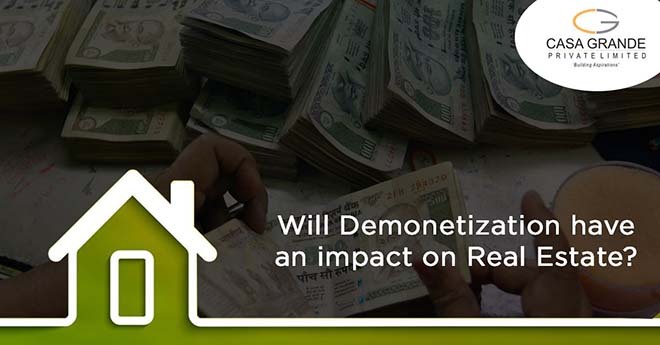 Demonetization has further helped developers to have a better chance of selling their properties upfront to customers rather than depend on property resales, which have higher cash transactions. The days are getting brighter for the real estate sector. Throw all your worries about demonetization out the window, and instead, focus on maintaining a good CIBIL score which can help you attain a healthy home loan.